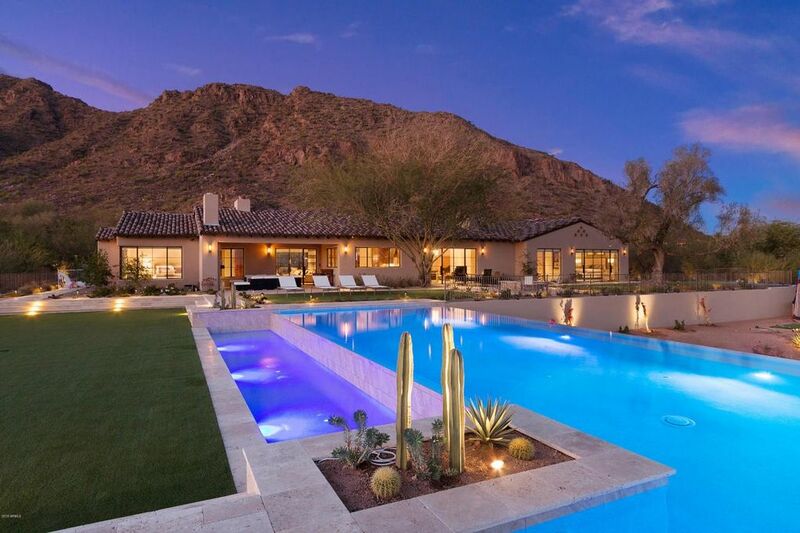 Extraordinary Home situated at the base of Camelback Mt on almost 2 acres, 7000 sq ft with TOP of the line finishes!enter through private auto/electronic gates.front court yard with water feature, gas fireplace, travertine/synthetic grass with Camelback MT. views! !HOPES WINDOWS throughout, solid WALNUT floors, interior doors r solid walnut w/concealed hinges!Chef's kitchen w/wolf appliances.all cabinets r custom walnut with inset doors, custom hood west side of home has work out room, mother-in -law area, LR, private entrance form/din area w/custom temperature controlled wine area.recessed linear vents , ALL lighting throughout this home is FULL CRESTRON automation, TRUFIG recessed lighting outlets throughout recessed custom linear vents, master closet custom walnut inset cabinets, waterfall edges on all counter tops in bathrooms and kitchen , spa like steam shower , electronic shades in master.high end bath room fixtures throughout. Master bedroom has own sitting area w/custom fireplace, powered by Crestron Surround Amp's , build in walnut shelving with its own exit to the back yard...Kids wing has large living area w/exit to private outside play area with synthetic grass.1 bedroom with private bathroom/walk in closet other 2 bedrooms share the custom designed bathroom Home has 5 gas fireplaces... Resort like back yard with large jacuzzi , putting green, fire pit, heated 56, 000 gallon 90%negative edge pool, Crestron custom landscape lightening and back patio gas fireplace and TV. also has recessed heaters in the walnut ceiling , patio speakers Sonance invisible surround sound .speakers in Main family room and Kids family room also Sonance Invisible Surround Lutron Homeworks outside custom lightening. Back yard built in BBQ, Crestron Landscape path lightening, step lightening, speakers..DSC NEO security sysytem , Camera system PENTAIR IntelliTouch, Pool and Spa CRESTRON . Enterprise network system for internet. Crestron 16x16 video Matris &Crestron controls whole house. HVAC high efficient multi stage Carrier units SEER 24 commercial grade....SO much ...call for your private showing!